What it is, is Alternanthera dentata 'Purple Knight,' also known as "joyweed. "1 The story is that it was brought in in the summer of 2006 as an annual, and when everything got brought in for the winter, they brought this in too, and it's been living in the greenhouse ever since, getting huge and changing colors and confusing people. The white bits in the second picture are flowers, which are tiny clover-like things that eventually drop seeds everywhere: I've found quite a few Alternanthera seedlings growing on the greenhouse floor. I haven't tried to plant any seeds deliberately yet, so I don't know how easily sprouted they are, but I'm guessing they're not difficult, considering the common name. 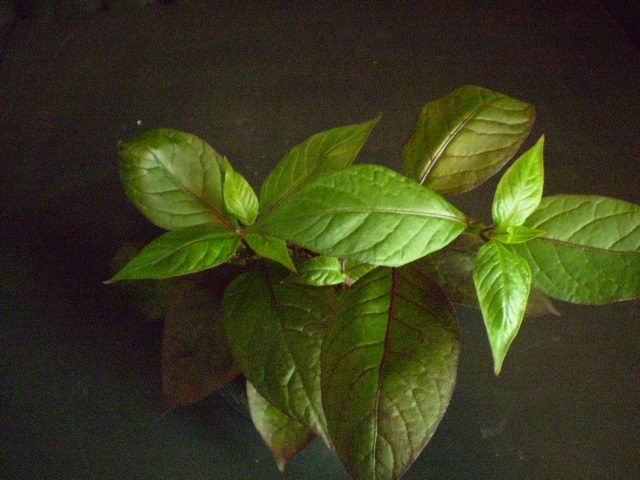 My own plant came from cuttings, which is sort of an entertaining experience with Alternanthera: when you first take a cutting, it will completely collapse within a few hours. And I do mean completely. Then it will remain that way for about a week, leading you to think something along the lines of crap, I killed it, at which point you will pull it out and throw it in the trash and hope for better luck next time, unless. . . .
You forget about it and go on about your business, in which case about 75% of the time, it will pop right back up, yell "Surprise! Fooled ya!" and begin to grow. 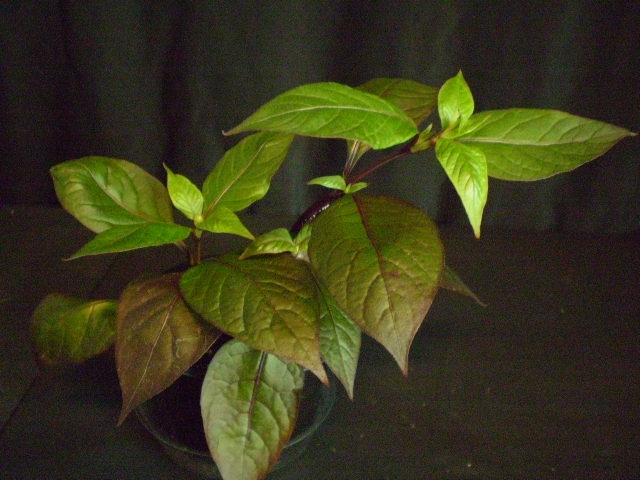 That remaining 25% of the cuttings really are dead, but you have to wait until they go black and start to rot before you can be sure. I don't know why it's considered an outdoor plant more than an indoor one; obviously it can perpetuate itself indoors for a while in greenhouse conditions, and mine hasn't shown any real signs of decline since bringing it home,3 which makes me think it can handle normal home conditions too. It's possible that they get scraggly-looking or something after a while: the one at work got really wild and leggy all at once when it decided to bloom, and so far I haven't really managed to get it under control. It seems very focused on building long, mostly leafless stems for the flowers, and cutting these back just makes it try harder. Care seems to be remarkably easy: I keep it pretty evenly moist – it doesn't like to be dry – and give it the brightest light I'm capable of (which is apparently not enough to maintain leaf color, but at least the leaves are still reasonably large, and it continues to grow more of them), and pinch back the growing tip when it looks like it's getting too tall. It grows fast, befitting the "joyweed" name, and doesn't seem to have slowed down any yet, so it may be the case that it's one of those plants like Tradescantia pallida that you can count on to keep you busy during a long winter. Though it could just be playing with me. UPDATE: I didn't have a picture or a cutting handy when I wrote the original post, but I had my plant collapse on me, so there is now a small follow-up post available here with a photo of a collapsed plant. If you wanted to know what that looks like. 2 It also looks that way in person, though like I say, the color changes a lot: bright green in lowish light, maroon if it's hanging up near the top of the greenhouse in full sun, and sort of a dark purple if it's getting bright light but not full sun. 3 Granted that I also have it in greenhouse conditions here, kinda. I'll have to do a post about my jerry-rigged mini greenhouse sometime. OK, I want to read about your "mini-greenhouse" sometime soon, please! I mean, it's not done, but I'll work on it. I suspect this is one plant that would do much better if you considered letting it sit (gasp!) in water. I have not grown A. dentata though I have grown A. ficoidea with wet roots, managed to get it to flower (but got bored and got rid of it, didn't have high enough light to get the colour nice on it). A. reineckii is actually able to be grown completely submersed and is one of the most popular "red" aquarium plants. I think if you have a spare cutting try growing it in very wet conditions and see how that performs for you. and also, Andrew is right, this plant loves to be started with wet roots! I take cutting from my plant all the time. I just toss them in water and the root system grows long, thick, and wtih lots of root hairs which establish a stronger plant. I am so glad I found your post! I moved into a house last year with beautiful gardens, two of which are overrun with this plant. 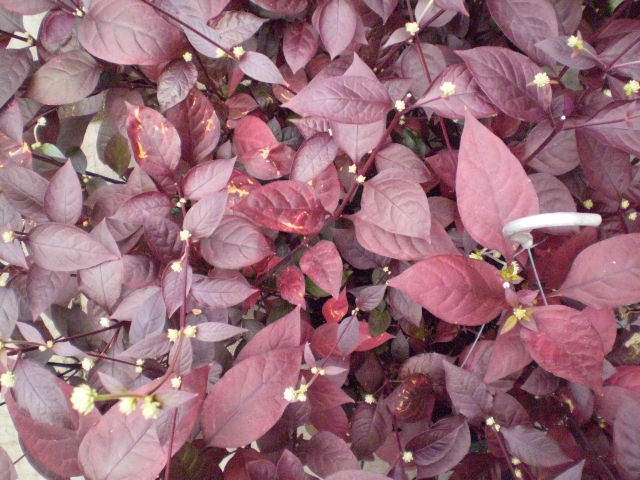 The leaves on mine are purplish-green, probably because it is partly in the shade. I had been wondering what it was and couldn't find it online or in the perennial books (I guess because it is an annual), so thank you for posting information about it! Alternanthera dentata is a common carpet-bedding plant. It's done largely by cuttings. Keep 1 node for leaves and one for roots. Results are improved by dipping in rooting hormone. We put our cuttings in a soil-less mix like BM6 and throw it under a mist bench. Like you said, it only takes a week. To keep the plants from collapsing, the humidity should be kept high. I also found that cutting large leaves in half improved this. Hi, your post is funny and the comments are so informative. Thanks, all, I usually get my fun fix from gardening forums like yours where i find people are generous with their knowledge and have a good sense of warmth and humour. So, about this plant, whose name I was searching for when I found your blog, yea, mine also did that 'I'm dead' trick on me. 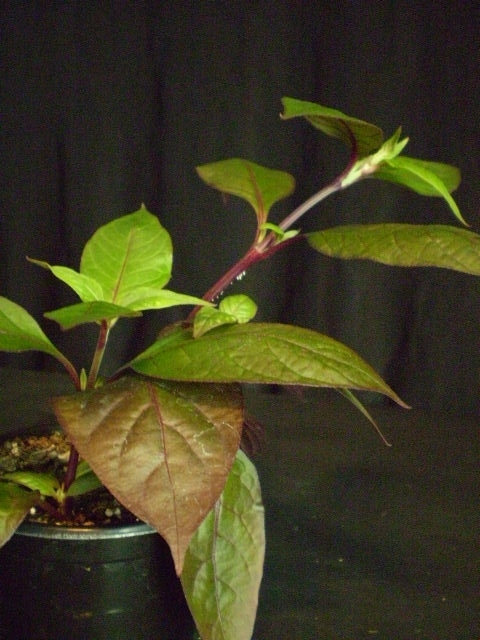 Luckily, i just let it be, and now the slender stem that i planted about a month ago, has put on a couple of pairs of new leaves and has the most gorgeous, bright maroon colour! I love my Purple Knight, which of course, outside, here in southern Florida, it stayed bright red/purple. I just cut mine back and getting ready for the seeds to arrive. I literally pulled all the plants out of the ground last year, and then this year they all came back with a vengeance! They are so aggressive, but down here, they are perfect. Thanks for posting...I am always so happy to read about them! P.S. I take 6-7 cuttings and put in a glass of plain tap water in my kitchen window, and in 2 weeks they have tons of roots! So easy to propogate!